Score big with sports fans with the super Sports Splash inflatable bounce house. Featuring basketball, soccer, baseball and football, your sports-loving guests will get a big kick out of this sporty bounce house. 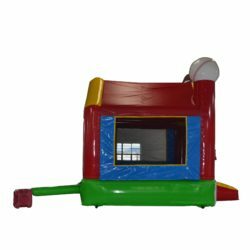 So colorful with red, blue, green and yellow sides, this playful bounce house will be a home run at your next party or event. In addition to all of these fun features, this bounce house was designed with safety and durability in mind and constructed with only the highest quality 15 oz. “lead-free” materials. Dimensions: 13’L x 13′, Weight: 176 lbs.